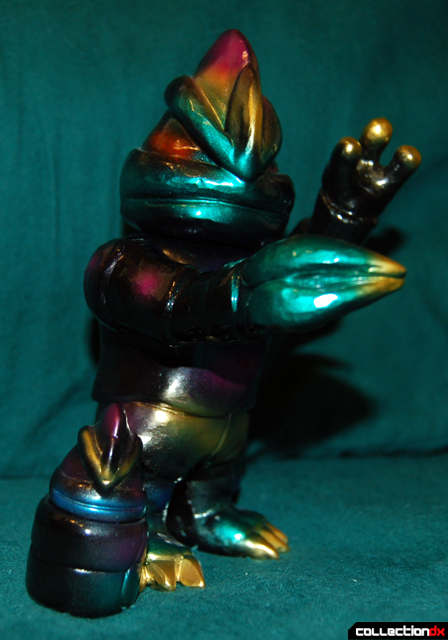 Gatchigon is part of the Lord of Jujin subset of RxH fight figures, designed to be similar to the Mutant Zone line with a heavier classic Kaiju flavor. Gatchigon is described in the new Encyclopedia of Kaiju book as being an underground creature based on a bamboo shoot motiff. 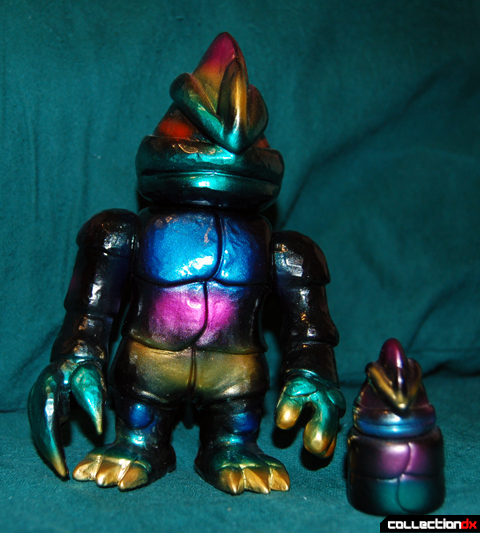 Gatchigon features an entirely original sculpt featuring a big, sort of abstract head, a big claw, and much heavier-looking carapace of a body that features much more texture than the regular mutant body. Gatchigon also comes with a bonus figure: a baby! Made of two parts and articulated at the neck, the baby uses the same body texture as the adult, which makes the baby look like it is in swaddling clothing. 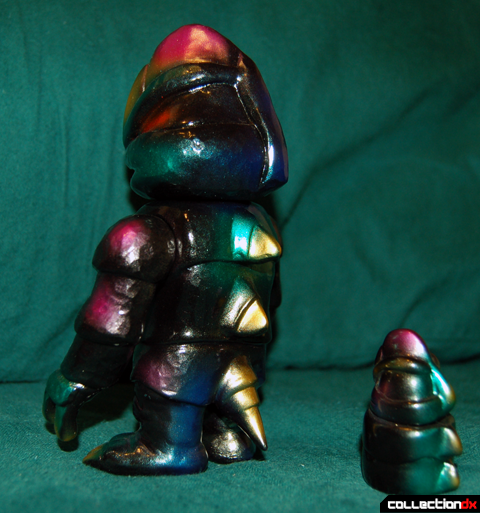 For the first Gatchigon release, clear smokey vinyl filled with GID vinyl shards, the baby was unpainted hunter green vinyl, but for every other release the baby has matched its caregiver. The Gatchigon sculpt is my favorite fight-figure size RxH figure (this statement will make more sense in a couple of reviews). The sculpt features a texture similar to beaten iron, and it takes all sorts of different paint applications in a cool and unique way. 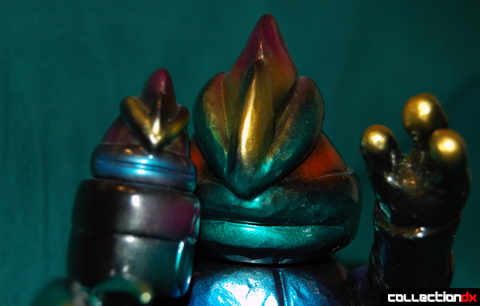 I have just about every Gatchi release (which is a much smaller number than say, the Chaos releases), and each version takes advantage of the sculpt. The figure used for this review features some glorious metallic paint on lustrous black vinyl, and it is awesome. Aside from a couple of specific releases, most Gatchigons are actually pretty easy to find, so if you’re interested in seeing what Real X Head s all about, you could not go wrong with a Gatchi! What the hell is a "fight figure"? Fight figure describes a specific format of Japanese vinyl figure loosely based on the style of classic action figures like MoTU and Ninja Turtles with their exaggerated proportions and size. JP fight figures are between five and six inches tall and feature stylized proportions with big torsos and heads, long fighty arms, and short legs. Real x Head, Secret Base, Gargamel, Yamazakura, and others subscribe to this format. Fight figs are fun because they are kinda doofy looking, pose great in groups, and specifically fit in your hand and feel great. 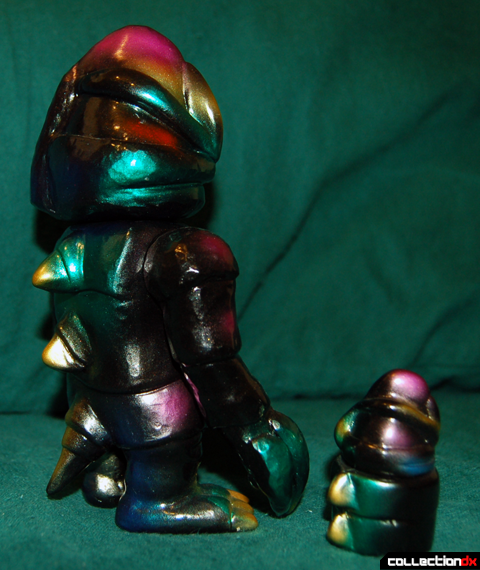 They are bigger than a mini, more portable than a standard kaiju, and a ton of fun.